UP Police Student Cadet Recruitment 2019 The Meaning of Students Police Cadet is to Watch Curricular Activities of Children who are engaged in other work and not going to school or we can also says it as Latest jobs in UP Police as a Volunteers or as a Jobs. 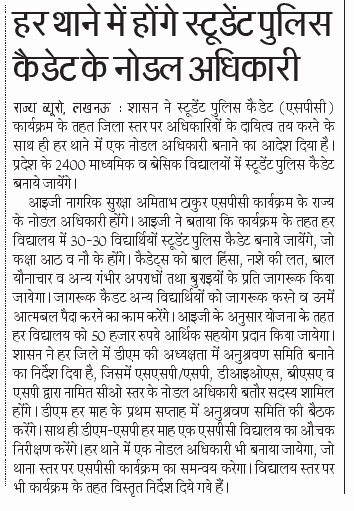 Students Police Cadet Scheme in UP: One Nodal Adhikari Posted in Every Police Thana, where he/she will select school in which 30-30 student for making Student Police Cadet. This latest news came before Election time and Chief Minister Adityanath Yogi already approved UP Students Police Cadet Scheme. Organization: Ministry of Home Resource Department. Educational Qualification: Eligible Students appointed from 8th and 9th class as a Student Police Cadet from every School 30-30 Students. Amount/payment/salary in Student Police Cadet: Government will also give 50,000 Financial Assistance (educational aids,books, training and contingency.) to that school who are interested in their scheme. May be student can also get some scholarship or help (working as student police cadet). 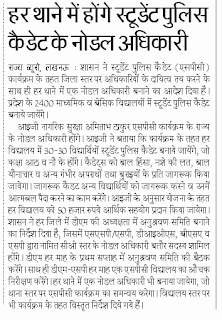 UP Student Police Cadet Scheme Online Form 2019: The latest news update of Students Police Cadet will soon go online and whenever they announce to fill form or published advertisement. We give you information of it. Document Required: Adhaar Card, Studying in Government specially UP Board, May be other board such as Madarsa Board, Sanskrit Board, Ashram Paddati Vidyalaya may also in Name list of Students Police cadet scheme of UP.